The recovery needs in Nepal remain tremendous. High in the hills of Sindhupalchowk, Nepal, sits the community of Nagpuje – a small hub of agricultural activity that lies a mere 12 kilometres from the Tibetan border in one of the areas worst affected by the earthquakes of 2015. Their school is Bachchhala Devi – once the joyful nucleus of this community of subsistence farmers, but reduced to a mere pile of dust by the event that shook the lives of so many in Nepal. Close to 8,000 schools were destroyed during the two earthquakes, not only disrupting the education of countless children but also destroying their daily safety net and the hubs of thousands of communities. As we see in Nagpuje on a daily basis, schools really are the centre piece of community life post-disaster as they serve such an essential role in helping children and their families cope. The children who attend the school of Bachchhala Devi come from far and wide, walking up to three hours each way, to attend what is now a temporary learning centre. Many of the classrooms are mere tarp, flapping in a glacial wind that only subsides once the sun hits that side of the mountain for the day. A temporary classroom is exactly as it sounds: temporary. A basic structure that is designed to act as a stop-gap until normality can be restored and sadly one that has now become a permanent feature throughout Nepal. This is a country that is affected by erratic weather conditions – from bracing winter winds to violent storms during monsoon season – leaving these temporary classrooms far from effective. They are generally constructed on mud floors and use corrugated iron for the walls and roof, neither of which provide much insulation from the elements, and are often small, resulting in crowded classrooms that are vulnerable to both earthquakes and storms. Yet despite the conditions and their long morning hike, the kids race towards their classes each day, taking a moment to delightedly wave and call greetings to the construction workers – volunteers with All Hands Volunteers – currently laying the first layers of bricks to what will be their brand new school. Today marks the two year anniversary of the event that rocked Nepal to its very core, taking over 9,000 lives, devastating entire communities and destroying countless homes and schools in its wake – and still, two years on, these temporary solutions remain the reality for many of the children of Nepal. Daily life in Nagpuje is merely representative of so many other affected communities throughout the land. Indeed, one of the greatest tragedies in the aftermath of natural disasters is what happens to children when their lives are turned upside down. Amidst the chaos of their new world and with human survival the top priority, it is easy to see how education can appear to be of less urgent concern. But schools are not only accountable for providing education – they also provide safety, stability, hope, and an element of normalcy that can help children and their families cope with life-altering events. As the glare of the media swiftly moved away from Nepal and onto more pressing matters, so too did the much needed presence of local and international NGOs. 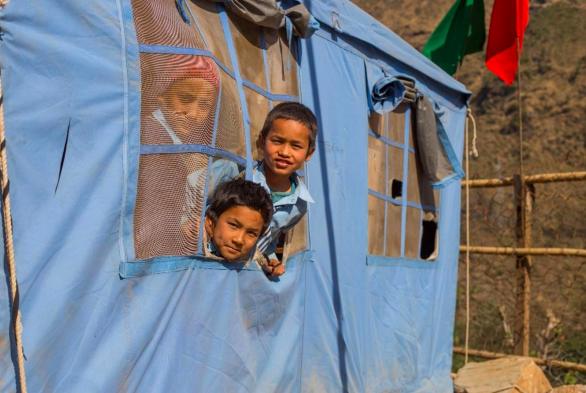 But the reality is that the recovery needs in Nepal remain tremendous – from the logistical challenges posed by the remoteness of some of the 31 affected regions, to sourcing material supplies and the finances required to recover from the sheer scale of the disaster. For us at All Hands Volunteers, there have been significant challenges. Funding is one, with official reports stating that a further 167 billion rupees are required to fully rebuild all 7,923 schools that were affected by the earthquakes. Another considerable obstacle has been the remoteness of the regions we are trying to assist. 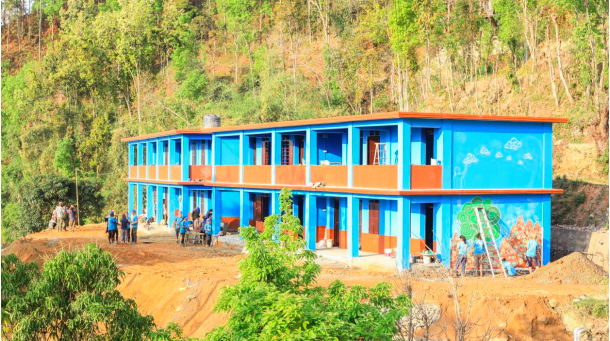 Building schools up the side of a mountain is no mean feat. With roads often in a terrible condition that is merely exasperated by monsoon season and its onslaught of landslides, suppliers are understandably reluctant to travel, leaving materials in short supply. The weather can be extreme and the terrain can shift shape so easily during monsoon that the sites have to be engineered so as to provide long-term protection against the elements. As an organization, All Hands Volunteers prides itself on both identifying challenges that have yet to be addressed and working with the local communities to find appropriate and cost-effective solutions. In Nepal, the communities we have identified have not been forgotten, but merely labelled problematic and logistically challenging, and therefore been largely ignored until now. And yet we have found that working closely with the communities is the solution itself – they are dedicated to their schools as they acknowledge that these are not just classrooms. They are the very foundation for the development of future generations. All Hands Volunteers landed in Kathmandu 72 hours after the first earthquake hit in April 2015. We have since welcomed close to 3,000 volunteers through our doors – they flock from all corners of the world, determined to play their part in the reconstruction of this beautiful country. A bundle of warmth and hard-working hands, these volunteers have impacted over 20,000 people in the process of rebuilding homes and putting kids back in schools. Several schools were recently completed in Nuwakot and with others well underway in Sindhupalchowk, it is now a race against time to get these children back into safe classrooms before yet another monsoon season hits and delays all progress. The reality is that Nepal is a strong, proud, and incredibly resilient country. But the scale of this disaster means that despite the progress that has been made over the past two years, ongoing national and international support is critical to ensure that headway continues to be made. The challenges are very real – but they are not insurmountable. The process will be unrelentingly tough and extensive, but with continued financial and physical support, our mission to rebuild hope by getting children back in school can also be a reality. 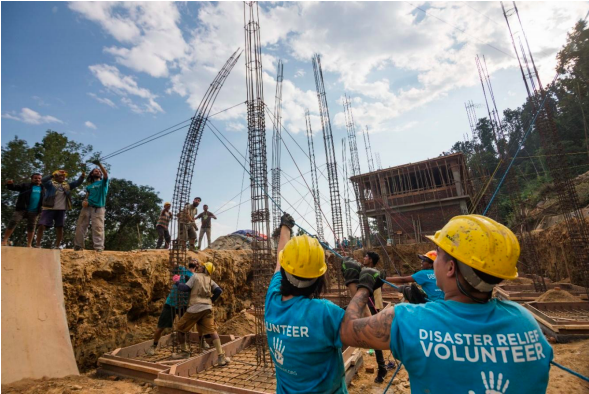 Acknowledged to be the leading global disaster relief organization powered by volunteers, for over a decade All Hands Volunteers has accepted over 39,000 volunteers from innumerable countries, leveraging their manpower to provide assistance to over 500,000 people worldwide.